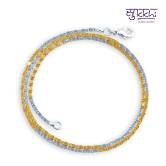 Add feminine flair with masculing touch with this fantastic chain. It seems like a classic piece you can use with other jewellery.Feature:Brand: Sukkhi Vendor Name: Marshall ArtsStone: Cubic ZirconiaMaterial: AlloyGender: FemaleColor:Golden & SilverShipping Dimentions & Weight:Length - 5.5"Breadth - 4.0" Height - 1.5"Weight - 114gProduct's Length & WeightLength: 18"Weight: 9gNOTE: Avoid of contact with water and organic chemicals i.e. perfume sprays. Avoid using velvet boxes, and pack them in airtight boxes. After use , wipe the jewellery with soft cotton cloth.